Windy City LakeShake has come and gone, but the memories will last a lifetime! The event was filled with action between all our favorite country artists performances and festival fun! Here are some of our favorite moments from the three-day event (what’s yours?)! 2. 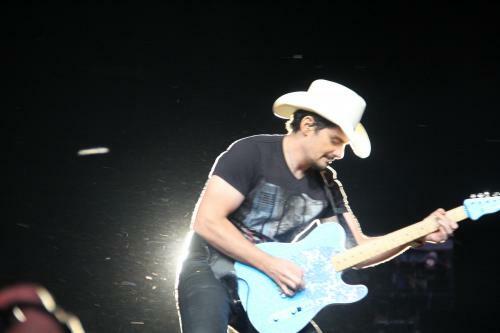 Brad Paisley sticking around on Sunday. Brad Paisley was the perfect storm! The night may have ended early on Saturday, but a little rain wasn’t going to stop Brad from staying in Chicago! Sunday night ended the best possible way it could have – with an extra performance! Did we mention he had a bar on his stage? 3. Florida-Georgia Line Singing With Frankie Ballard & Thomas Rhett Wearing Blackhawks jerseys. The boys showed off their Blackhawks pride right before bringing out pals Frankie Ballard and Thomas Rhett to sing ‘Party People.’ I guess Tyler Hubbard taking his shirt off could be one of the top moments for some of us out there, too! 4. Brad Paisley giving his guitar away to a little girl. Brad Paisley is a heck of a guy! During his performance, he reached out his guitar to give it to a pint-size fan. She’ll remember that day for the rest of her life! 5. Kelsea Ballerini hit No. 1! It was a good day for Kelsea! Not only did she perform on the Nashville stage at Windy City LakeShake, but she hit No. 1 with her single the same day! Congrats Kelsea!